Russia's dominance of the global Mixfight scene was proven further this week as their Sambo 70 squad schooled the Spanish Warriors team in Moscow. The outcome may have been very different if the nations had met on a football pitch. Although as soon as it comes to the mat, ring or cage, a Russian selection often tends to have the edge over their Spanish rivals. This time out one of Russia's strongest Mixfight clubs – Sambo 70 – prepared to test the best Spain had to offer in the sport. Five fighters each with the competition, as is tradition, starting with the lightweights. The first face-off saw Thai-boxing specialist Sergey Golyaev taking on Jiu-Jitsu champion Ramon Diaz. 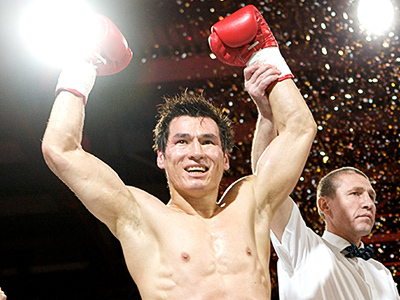 The visitor was keen to take the fight to the ground, but Golyaev took his chance with a sudden kick out of the clinch. Fight over – Russia 1-0 up. The hosts’ hand-to-hand fighting champion Andrey Koreshkov took on Abdula Dadayev next. And the Russian executed a perfect armbar submission to force the Spaniard to give up the fight early in the first round. With two other clashes following a similar pattern it soon came to the most anticipated battle of the night. M-1 Global champion Vyacheslav Vasilevsky facing Enoc Solves – the man voted Spain's best mixfighter of last year. This was a much closer bout than all that came previous, and the only one to last all three scheduled rounds. Vasilevsky proved his class though dominating the entire fight to claim victory by a unanimous decision.